By increasing the excitability of a subpopulation of “defective” inhibitory neurons, researchers at the UNIGE restore the synchronization of neural networks in the hippocampus, and are thus able to suppress certain behavioural symptoms associated with schizophrenia. Schizophrenia, an often severe and disabling psychiatric disorder, affects approximately 1% of the world’s population. While research over the past few years has suggested that desynchronization of neurons may be the cause of its neuropsychiatric symptoms, such as memory disorders, hyperactivity or hallucinatory phenomena, the cellular origin of such desynchronization remains poorly understood. Today, a decisive step in understanding this disease has been taken. 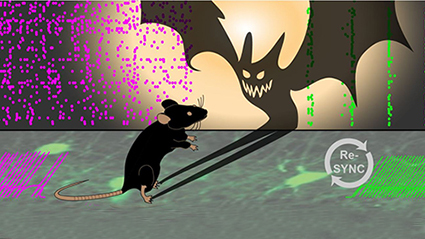 Researchers at the University of Geneva (UNIGE) have succeeded not only in deciphering a cellular mechanism leading to the desynchronization of neural networks, but also in correcting this organizational defect in an adult animal model, thereby suppressing abnormal behaviours associated with schizophrenia. Results, to be discovered in Nature Neuroscience, that show that a therapeutic intervention is possible at all ages. Schizophrenia, which clinical manifestations may differ from one patient to another, is a neurodevelopmental disease characterized by many cognitive and behavioural symptoms, including visual or auditory hallucinations, memory and planning issues, or hyperactivity. While the exact cause of this highly disabling disease is not yet known, certain genetic mutations greatly increase its risk. For example, individuals affected by the DiGeorge syndrome are 40 times more likely to develop schizophrenic disorders than the general population. The DiGeorge syndrome, also known as the 22q11 deletion syndrome, is a human genetic abnormality marked by the absence of about thirty genes on one of the two copies of chromosome 22. “What happens in the brains of patients suffering from these behavioural changes characteristic of the disease? Our aim was not only to understand how their neural networks dysfunctions, but also to figure out whether it was possible to restore their normal functioning, especially in adults,” explains Alan Carleton, professor in the Department of Basic Neurosciences at the Faculty of Medicine of the UNIGE, who directed this work. The second step was to try to restore the synchronization necessary for neural networks to function properly. To do this, the scientists specifically targeted the parvalbumin neurons of the hippocampus. By stimulating these dysfunctional inhibitory neurons, they managed to restore the sequential organization and normal functioning of neural networks. Similarly, they were able to correct some behavioural abnormalities in these schizophrenia mouse models, suppressing both hyperactivity and memory deficit. Current treatments for schizophrenia are primarily based on the administration of antipsychotic drugs targeting the dopaminergic and serotoninergic systems. In spite of their positive effect on hallucinatory symptoms, they remain less effective to improve many symptoms, and in particular cognitive symptoms. An approach aiming at overcoming the defect of parvalbumin neurons to increase their inhibitory effect therefore appears to be a promising target; nevertheless, time will be needed before a treatment based on this strategy is developed. The neuroscientists now want to confirm their results by extending their research to schizophrenia resulting from genetic alterations different from those of DiGeorge syndrome.